I am not ashamed to say the chef and I came from nearly nothing when we moved to NY in 2004. Well, we had two cars filled with clothes and some lamps and such, but really-how much can you fit in a couple of automobiles? Some of our first cookware was from Wal-Mart. And no, I'm not ashamed of that either. You see the chef refuses to cook with some sub-par (aside from us NEEDING a boiling pot from Wal-Mart) so he wouldn't buy anything unless it was All-Clad "because that's what real kitchens use". Well it was fine by me because I didn't really mind the Wal-Mart stuff. But it was getting a little annoying-I mean sort of embarrassing. Then one day I struck gold! I was in Ohio visiting the fam at one my most favorite shops: Home Goods. I was searching in the kitchen wares section through countless little Italian porcelain chefs holding novelty signs "The Kitchen is Open" , "Live Laugh Love" when I saw it. A 12 inch All -Clad saute pan with lid! Right in the middle of HOME GOODS! Now, something had to be wrong with it since it was in HomeGoods, they were not able to sell me a full priced saute pan. But I let out a sigh of relief when I noticed the "blemish"- a 6 inch scratch on the bottom of the pan. Not too bad for $89. Again a year later or so I was in Ohio again, and yes I was in HomeGoods (family tradition) and I found another pot!!! This time it was an 8 quart copper core pot with a lid! Again it was discounted at an extreme rate and I couldn't pass it up. So what if the lid was a little tight on it! So now I have decided that Ohio only means good things for us. 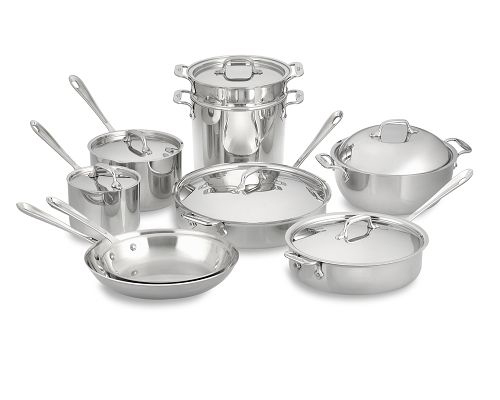 We found two amazing pans/pots and my chef was promoted twice while on vacay with me in Ohio. And he still won't move there (???) Haha. The plan is to continue to hunt for All-Clad cookware and never pay full price. I should have a complete set by 2012. I believe there are HomeGoods stores all over the U.S. and not just in Ohio. Like CA for instance. There are HomeGoods all over. However I've only found my discounted all-clad merchandise in the ones in OHIO. No chef starts at the top so there is indeed nothing to be ashamed of using walmart pots to begin with..hahaha. My husband was the same way about his knives...there all the same the to me but he's extremly picky about his knives..he actually has his own set at home that no one uses except for him.